Draw the time to the half hour by being very careful to draw the hour hand in the right place, just a bit after the hour number. Answer sheet included. Draw the time to the half hour on each round clock. There are only nine clocks to the half hour. Which three are missing? Can you figure it out? 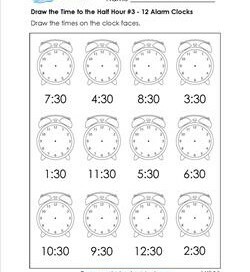 Here are nine round clocks for your kids to practice drawing the time to the half hour. Make sure they remember to put the long hand on the 6! 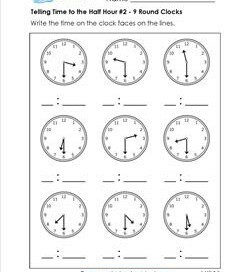 How can you tell what time it is? By looking at the clock, silly. 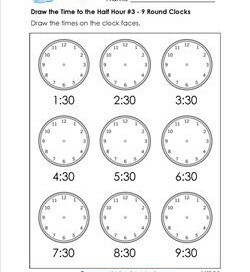 So take a good look at these clocks and draw the times on all the clocks to the half hour. For every one of the times kids will draw to the half hour on these clocks the minute hand goes in the same place. Can your kids tell you where that is? What would these alarm clocks be used for? What would kids do at half past the hour? Have them choose one of the times and say what they might do at that time? These clocks are a bit small so you will need to draw the time to the half hour very carefully so the hands are in the right place. Good luck! Answer sheet included. 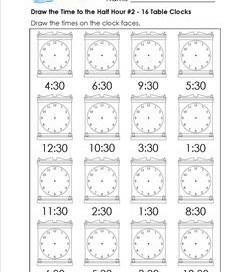 This worksheet has 16 clocks for kids to draw the time to the half hour. Have them draw lines as straight as can be – and don’t forget the arrows on the end. 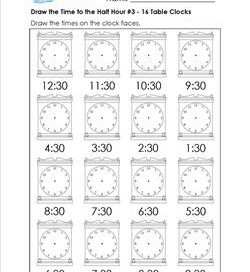 Draw the time to the half hour on each of these clocks. Look at the times carefully. Draw carefully. Do you see a pattern on each line? Describe the pattern.